The truth of the matter? It’s because you’re not being told how to successfully apply the common sense in a way that makes sense to your unique circumstances. Let’s break this down in four simple categories beginning with your personal goals. Do you have any? If you do, are you committed to them and have you defined clear reasoning why? An example of a short goal: My goal is to buy ____________. The actual goal for this thought is left blank because no matter what it is you want to purchase or why you want to purchase it, this is only a 1 to 2 year goal lacking any long-term vision. The changes you make to buy whatever big ticket item you have your heart set on will only last short-term. It sets you on an unsustainable lifestyle that you eventually won’t be happy with. Short-term goals are valuable when they’re about taking steps to create long-term life-changing money habits. An example of a concrete long-term goal: I want to retire with $___________ in my bank account. Ding, ding, ding! We have a winner. Setting a numerical goal for something that is at least five years in the future is what’s going to cause you to make a lifestyle change that allows you to live fulfilled both now and in the future. Think of long-term goals as the foundation for your financial planning. They are the stepping stones that you build to create the rest of your financial decisions on. The difference in setting goals that stick and setting goals that fall to the wayside a few months down the road is your desire. Also your enthusiasm in taking the steps necessary to achieve them, day-in and day-out. The saying is tried-and-true, “You can lead a horse to water but you can’t make it drink.” You need to take some time and make the commitment to set goals you truly want to see come to fruition. Otherwise all the articles, tools, and planning in the world won’t help you change your current financial situation. Once your goals are set, it’s time to break down how exactly you plan on achieving them. A goal is great to have but without mapping out the steps to get there, you’ll be stuck. Starting with the basics is the best way to create a new habit. Habits are formed one conscious decision at a time. 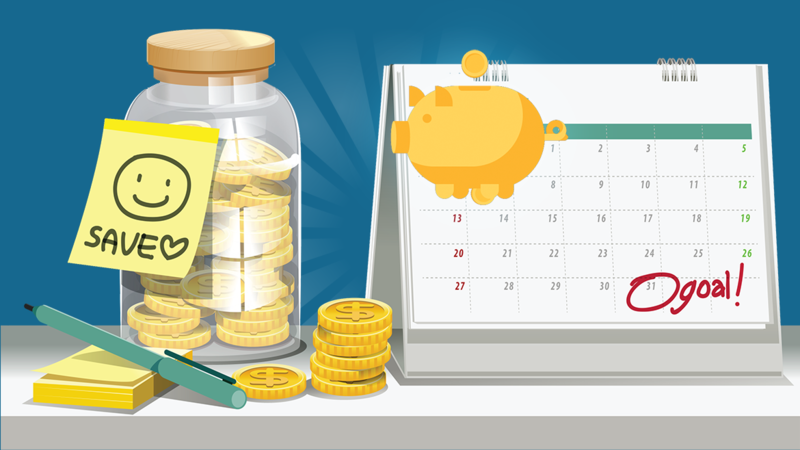 Setting up a budget today contributes to your long term success tomorrow. Revisit it every time you have any income changes to keep it relevant. The best way to make a budget is to add up all of your monthly bills and necessary expenses. Leave out your morning coffee run, and your weekly happy hour with coworkers. Once you have your bills, gas, groceries, rent or mortgage figured out, calculate your households net monthly income and subtract your total expenses. Now the fun part, the amount that comes up is the amount you put towards your long term goals. Remember, you’re future self with thank you later. After all of that is factored out and put away in the accounts you have set for savings, then you can figure out how many days a week you can put towards your wants. Wants are things you buy that aren’t necessities. Set your priorities on what is ultimately best to reach your highest standard of living. The easiest way to implement a budget is to make everything automated. The majority of companies have a system in place that permits you to have your bills taken out of your bank account automatically each month. The only responsibility you’ll have is keeping the right amount of funds available to avoid any overdrafts. When it comes to your living expenses, set a spend amount before you go to the store. Make grocery lists before you go shopping so you’re not tempted to give in to any cravings as you’re walking through the store. To take it one step further, sign up for services like Amazon’s Subscribe and Save. The service sends automated monthly deliveries on non-perishable items. This cuts down on the time you spend in stores. You’ll even save the gas it takes to get back and forth from the store! To take your savings a step further use a cash back rewards card to pay for your everyday expenses. You’ll be able to monitor your expenses, and with each purchase you can receive a discount anywhere from 1 to 6 percent – depending on the card you use. The greatest value from a cash back card comes when you use it responsibly. This means always paying it off in full at the end of each month. Due to your financial habits, your credit scores will improve over time. This will put yourself in a better financial standing. Having debt of any sort has a detrimental effect across your entire financial life, especially your credit scores. Most people avoid talking about credit scores and credit cards like the plague, but the reality is that credit cards are an easy way to build strong credit scores, and you need good credit scores to build a solid financial foundation for your life. If you choose to use credit cards, do your best to pay them off monthly to avoid any additional interest charges. Courtney Reed is a Financial Industry Analyst at CreditCardInsider.com. With a background in studying industry trends she is driven to provide the most current and accurate information available. She researches common problems businesses face and provides solutions.